G. Roy Horst was born July 13, 1933 in Ephrata, Pennsylvania, to Amos and Mary Horst. His parents were poor, subsistence farmers who were strongly committed to the precepts of the Mennonite faith. They were a large family of eight children, of which Roy was the oldest son. His only brother is twenty years younger than he, and thus was of little help on their farm in those early years. As a consequence, Roy could not be spared to attend school beyond the eighth grade. Fortunately, Roy's parents felt strongly that he should receive as much education as possible under those difficult circumstances, and thus encouraged him to read and study whatever books and other materials were available. His most prized possession was the monthly issue of National Geographic magazine, in which he discovered a story about the Pennsylvania Dutch Mennonites, featuring a small boy (it turned out to be Roy) that appeared in the July 1940 issue. He did in fact read every article in each issue of that magazine for the next fifteen years. Such reading served as his "home schooling" in place of what other children learned by attending high school. Daily life on a farm was filled with all sorts of animals and crops, for which Roy was partly responsible. In retrospect, Roy considered this a superior experience compared to what most students were taught in high school biology. When Roy reached the age of 19, his parents were forced to sell their farm and he found himself without an occupation and little formal education. After a few years of menial employment as a hired farm hand and a few other uninteresting jobs, Roy decided to apply to college. He completed the General Education Development (GED) Examination and scored well enough to be admitted to Eastern Mennonite College, where after a year of mostly remedial courses, he found himself subject to being drafted into the armed forces. As a practicing Mennonite, Roy was automatically registered as a pacifist and conscientious objector. In those days pacifists were given the opportunity to perform "public service vital to the nation's welfare" as an alternative to service in the armed forces. He was assigned to service in a public health hospital for two years. Fortunately, this hospital on Staten Island, NY, was only a short distance to Wagner College, where Roy enrolled as a part-time probationary student. When his alternative to military service was completed, Roy was accepted as a regular student at Wagner. To Roy, it seemed logical to choose biology as his major. The late Ralph E. Deal, Professor of Biology and Chairman of the Department agreed to be his sponsor and became his trusted and revered advisor throughout his undergraduate career. He graduated with a double major in biology and in philosophy in 1959. After graduation, Roy was admitted to Boston University Medical School, but after one year he decided that medicine was not for him and thus transferred to Cornell University where he began a full-fledged biology program under the generous and wise guidance of Dr. William A. Wimsatt. It was Professor Wimsatt's passion for bats and other mammals that led Roy to a life-long interest in the biology of bats. The topic of Roy's Ph.D. dissertation was "Renal Structure and Function in the Vampire Bat: Desmodus rotundus," which he successfully defended in 1968. Roy's mentor, Bill Wimsatt remained one of his dearest friends for many years until his untimely death. Professors Deal and Wimsatt, as well as his parents, instilled in Roy the deeply held conviction that a life of teaching and service to others was as an honorable profession. As an undergraduate at Wagner, Roy was fortunate that he met Ruth Stelter, the daughter of Lutheran Missionaries who spent most of their lives working in India. Roy and Ruth were married in 1958 and have two sons, Gregory and Jeffrey, both of whom have earned advanced degrees, although neither pursued an interest in biology. Their extended family now includes four wonderful grandchildren, so there may be hope for another bat biologist in the family. Upon completion of his Ph.D., in 1968, Roy accepted the position of Assistant Professor of Anatomy at the University of Arizona College of Medicine, Tucson, where he taught medical students and conducted research on bats from 1967-1970. He subsequently was appointed Associate Professor of Anatomy at the University of Vermont, College of Medicine, where he remained until 1974. In 1975, heeding a call to become engaged in undergraduate teaching, Roy accepted a position as Chair and Professor of Biology at the State University of New York(SUNY) at Potsdam, where he remained until his retirement in 1998. During his career at SUNY-Potsdam, Roy also served as Director of the Office of Grants and Contracts from 1995-1998. A gifted teacher, Roy was the recipient of the Chancellor's Distinguished Service Professor Award in 1997, and upon his retirement, the Distinguished Service Professor, Emeritus Award in 1998. His research at the University of Arizona was funded by the Markel Foundation Career Development Grant, and later by grants from NIH (Renal function of bat and rat kidneys), NSF (Undergraduate Research Development), and Earthwatch (Population biology of the mongoose on the Virgin Islands, Puerto Rico and Hawaii). Roy has given approximately 75 presentations at national and international conferences, and is the author of over 40 abstracts and publications. His most recent publication is: G. Roy Horst, D. B. Hoagland, and C. W. Kilpatrick. 2001. The Mongoose in the West Indies; The biogeography and population biology of an introduced species. Pp. 409-424, In: Biogeography of the West Indies, 2nd edition (C. A. Woods and F. E. Sergile, eds.). CRC Press, Boca Rotan, FL. During his long and distinguished career, Roy was the co-founder and first director of the North American Symposium on Bat Research (NASBR). The first meeting of NASBR (originally called the Southwestern Symposium on Bat Research) was convened at the University of Arizona, Tucson in 1970, with a total of 28 bat biologists in attendance. Roy organized and directed 25 of the annual meetings of NASBR, and in 1995 was recognized for his yeoman's service at its 25th Annual Meeting, held in Boston (along with the 10th International Bat Research Conference). Roy has served on the Board of Directors of NASBR from 2000 until present, and in 2003, he was appointed as the first emeritus member of the board. 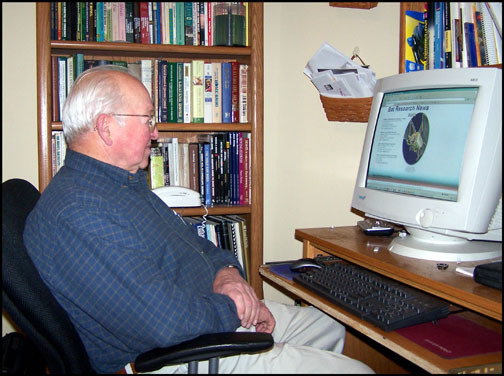 He served as Publisher and Managing Editor of Bat Research News (BRN) from 1977 to 2004. When he assumed responsibility for BRN's publication and distribution in 1977, this newsletter had four annual issues averaging about 25 pages, with approximately150 subscribers. The recent volumes, still quarterly, consist of approximately 200 pages with over five hundred subscribers. He is a Life Member of the American Society of Mammalogists and a Lifetime Member of the NASBR. Beyond his academic pursuits, Roy is involved with the Norwood Model Railroad Club. He is also a member of the Environmental Management Council of St. Lawrence County, NY. For the past few years he has served as Ombudsman for nursing home residents with the St. Lawrence County Office of the Aging. His favorite pursuits continue to include model railroading, civil war history, gardening, and "keeping track of the bat world." Web page by Margaret Griffiths, Publisher/Managing Editor, Bat Research News. Copyright 2006. All rights reserved.